The UK is a generous nation. According to the Charities Aid Foundation, UK citizens donated over £10 billion to charitable causes in 2016, and 61% of people report they have donated in the last year. Australians do even better, with over 80% of the population making donations in 2015-2016, giving away a total of $12.5 billion. Still, there are always more worthwhile causes and more people in need, and there is always room to give more, particularly to neglected, yet effective charities. In this article, we examine how several new insights and findings, particularly our understanding of societal norms, are being applied to help to nudge us into being a more giving society; with more of us donating to charity and giving larger sums too. To test this idea, researchers conducted an experiment over the course of 2 months at a free art gallery in Wellington, New Zealand. 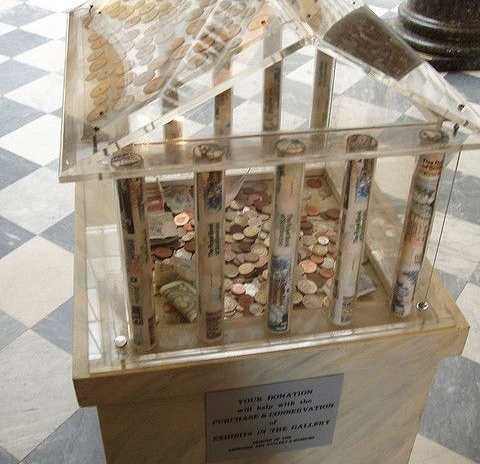 They placed a transparent donation box in a visible location in the entrance lobby of the gallery and then varied how much money it contained. Contained no money at all. Over the two months the gallery had around 21,000 visitors. Tracking contributions by visitors revealed that donation amounts tended to reflect the original contents of the box. New visitors tended to copy what other visitors had given before them. For example, a donation box containing a large quantity of coins resulted in a large number of small, coin-based contributions, whilst a box containing a few larger denomination bills resulted in a smaller number of contributions, but at a higher value. Boxes with money inside attracted significantly higher donations than completely empty boxes. This illustrates how social norms can sometimes influence when and how much we are likely to give. Seeing that others have already made a contribution seems to make us more likely to give, since we want to conform with what others have done before us. The coins and bills in the box may also serve as an anchor or reference point to suggest what amount may be socially appropriate to donate. Amounts and denomination might also signal the wealth or generosity of previous donors. Seeing the box is full of coins might signal that even the least well-off donate to this cause, whereas a box with a couple of $50 bills might signal that only the well-off or particularly generous or devoted art fans donate. Another study found a similar effect. 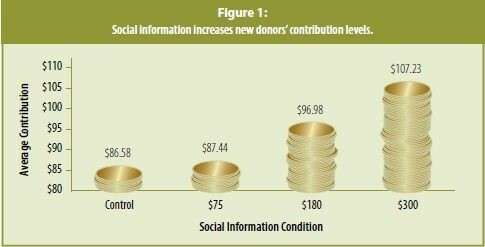 Mentioning the size of the previous donor’s contribution also seems to increase donation amounts. Rachel Croson, an economist at the University of Dallas, and Jen Shang, a psychologist at Indiana University, examined data from a phone-based public radio station pledge and observed how knowing how much previous donors had given could encourage listeners to make larger contributions. When callers were informed that a previous donor had made a contribution of $300 (where the average contribution was $75 dollars), they gave an average of 12% more. We might explain this by reasoning that, as in the previous experiment, we want to conform to what others have given. But behavioural scientists also note that we tend to make decisions by anchoring to reference points. In this case, the previous donor acts as the reference point and people adjust their own donation based on that amount. Note that if the contribution mentioned was too large, people did not give more, illustrating, as a previous study by Leif Nelson and colleagues also found, that anchoring effects have their limits. If the reference point we are given is too high, we pay no attention to it. Making a caller aware of a similarity between them and the previous donor raised giving even higher. One group of callers was told, “We had another donor who gave $300”. A second group of donors was given similar information, but with the previous donor’s gender matched to the caller’s: “We had another donor; he/she gave $300.” Sharing the same-gender as a fellow donor resulted in a 34% increase in donations, compared to the more general benchmark. Whilst we often want to conform to what others do, we are even more likely to conform if the ‘others’ are like us – and we have something we value in common with them. Charities could benefit from making prospective donors aware of what others have already given. 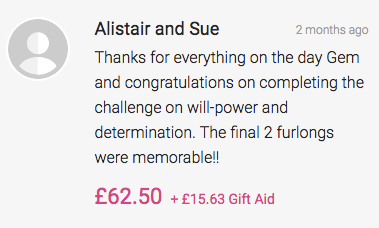 Some donation platforms, such as JustGiving (see image) provide an option to make this visible, but more likely we are just given a selection of donation amounts to choose from. Behavioural scientists and psychologists have found that we like to be consistent in our actions and maintain our identity. This seems to be true for many types of behaviour – from being a voter, giving blood, to playing sport and other leisure activities. If we’ve voted before, we feel compelled to vote again, if we’ve given blood in the past, we feel compelled to give blood again. A team of behavioural scientists set out to explore whether reminding people of their past donation(s) to a cause can increase the likelihood they will donate again to the same cause and even donate more. In a large-scale field experiment conducted with the American Red Cross (ARC), researchers sent direct mail to over 17,000 individuals who had previously donated to the ARC but had not contributed in the last 24 months. All letters used the greeting, “Dear Friend and Supporter,” but one set of letters also included the note, “Previous Gift: [date]” below the postal address. Researchers found that including this extra line increased the probability of a donation from 6.3% in the control group, to 7.6% - a 20% increase. Importantly, average donation amounts also increased by around 4%, from $3.41 in the control condition to $3.83 in the ‘Previous gift’ group. Whilst the increase in amount donated sounds small, if the entire mailing had included the extra line, the ARC would have raised an additional $7000; that’s $65,000 instead of less than $58,000. Those who have been past donors often feel greater commitment to give again. So charities could make good use of this finding by highlighting people’s previous donations and forging their identity as donors. If we have donated before, we are more likely to donate again – especially if we are reminded of it. 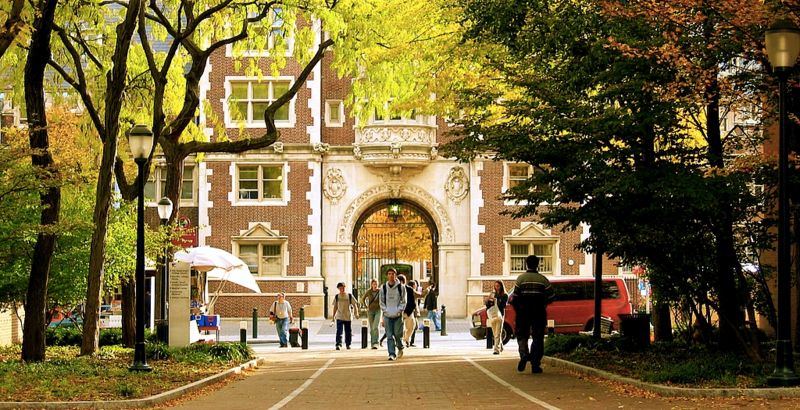 Yiwei Zhang, Judd Kessler and Katy Milkman at the University of Pennsylvania recently looked at what might prompt alumni to give to the university. One hypothesis they tested was whether someone receiving recognition as a past donor in the university’s Honour Roll might prompt them to give again and/or give more. The society we live in approves of loyalty, and consistent giving to good causes is an excellent example of this. Add to this our desire to be known to be conforming to these social norms. Zhang and her team wondered if alumni might value the opportunity to signal their loyalty. Taking a group of 120,000 Penn alumni, they introduced two public recognition programs for alumni who gave to the University in consecutive years. One program publicly recognised any donor in an Honour Roll, ranking them by $ brackets so that not only would others see that they had donated, but they would also get a rough idea of how much. A second program tagged donors with a symbol after their name on the Honour Roll if they had given consecutively over the last three years, allowing donors to signal they were frequent and consistent donors. In the year the programs were introduced, those eligible for recognition were significantly more likely to donate and donated more relative to those who were ineligible. The first program raised donations – some people even gave just enough to qualify for the next bracket up! In the second program, alumni were attracted to the symbol after their name and the prospect of being publicly recognised for previous sustained donations dramatically increased donations in the current year. Both programs, however, leveraged our desire to show society we are altruistic people. (And perhaps, more cynically, allowed people to show fellow alumni they were making enough money to donate regularly, boosting their status.) Charities and fundraisers could capitalise on this insight by publishing names according to the amount donated or ranking their most consistent and regular donors. These simple insights from the wealth of research produced by behavioural scientists today – that we are more generous when we are more aware of what others have given, when we are reminded of previous donations we have made to the same cause and if we are able to signal to others that we are a generous or regular donor - could be applied to help us build a better, even more altruistic society.